Carl LeBlanc (left) and fellow musicians perform at the 2019 French Quarter Festival. This year’s French Quarter Festival broke attendance records, organizers said, a result of near perfect weather on Sunday and despite the threat of severe weather on Saturday. The 36th annual festival, one of the largest free music festivals in the country, drew a record-breaking 825,000 people to the event’s four days, organizers said Wednesday. The previous attendance record was 760,000 people, set in 2016. 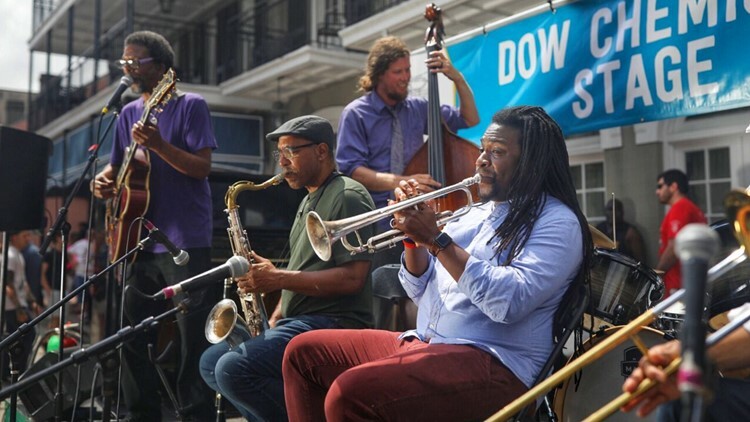 The festival introduced a new venue on the Moonwalk and an expanded evening concert series, as well as its returning stages and music venues throughout the French Quarter, including the WWL-TV Esplanade in the Shade Stage by the New Orleans Jazz Museum at the Old U.S. Mint. The festival hosted a total of 1,700 Louisiana musicians this year. The 2019 attendance figure tops the 560,000 people that attended last year, when Saturday's festival was rained out. The 2017 festival drew nearly 700,000 people. This year's crowd sizes could even have exceeded 825,000 since the attendance numbers are calculated based on headcounts done by festival security personnel, then adjusted down by percentage to account for repeat entrances and exits through festival gates. The attendance figures do not include attendance at the festival's Royal, Bourbon, Decatur, House of Blues, Preservation Hall, Pan-American Life Insurance Group, and French Market stages. The 2020 French Quarter Festival will take place April 2 through 5.